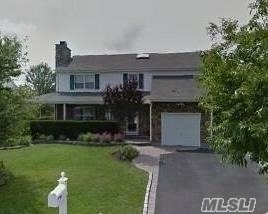 Stunning Colonial Located In Secluded Sagamore Farms! Stately Stone Work, W/ Wrap Around Porch Greets All As They Arrive! Large Rms Throughout, Formal Living Rm W/ Fplc, Dining Rm, Expanded Eat In Kitchen, Den, & 1/2 Bath All On The Main Level. A Master Suite W/ Fplc & Private Bath, & An Additional 3 Bed Rms, & Full Bath On The 2nd Level. Central Air, Full Fin Basement, 1 Car Att Gar, & A Gorgeous Rear Yard Perfect For Entertaining W/ Rear Decking, Huge Paving Stone Patio, & Custom Inground Pool!